Having given a guarded welcome to Volume 1 of this complete survey of Fibich's complete orchestral works, I'm pleased to say that Volume 3 is a marked improvement. My main concerns with Volume 1 were a solidly unimaginative interpretation of the Symphony and a rather synthetic and unsubtle recording. Both of these issues seem to have been overcome. Conductor Marek Štilec appears considerably more at home with the pictorial demands of these symphonic poems than he was with the abstract content of the Symphony. Likewise, the recording, suits the colourful nature of the scoring and any lingering 'technicolour' spotlighting of instruments flatters the music. 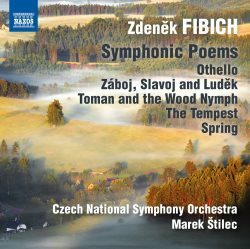 The Czech National Symphony Orchestra are good - there is a lingering Bohemian sound to their playing that I like a lot although it rather pales next to near-historic versions from Frantisek Vajnar and the Prague Radio Symphony Orchestra on Supraphon. These are demanding scores and in the more demanding passages the engineering highlights that the upper strings are under considerable pressure. None of the works are receiving premiere recordings but this disc's value is in bringing together for the first time such a comprehensive collection of Fibich's symphonic poems. In their own right all of these works are enjoyable to listen to without any seriously threatening the supremacy of Smetana or Dvořák either in terms of memorable melodies or orchestral colour. Another interest is that Fibich's symphonic poems pre-date those of his compatriots. The earliest work, Othello was first performed in 1873 which places it after Smetana's Shakespearian tone-poem Richard III but well before Dvořák's own essay on the subject - the concert overture Othello Op.93 written in 1891-2. Interestingly Dvořák suggested alternative titles to his publisher including Tragic or Eroica so the significance for him was the conflict between jealous and unsullied love. Fibich seems more concerned with a narrative that contains those elements too. Unfortunately the melodic material is relatively weak and unmemorable from the opening martial fanfares into the first theme's march-like character. There is a sense, and this occurs often when Fibich's inspiration is not burning high, that the music and orchestration is rather academic and formulaic. The playing is certainly good and I like the way the Czech NSO have retained elements of their unique sound - particularly in the wind and brass. The 'innocent love' theme presented by the oboe accompanied by harp [track 1 4:00] is quite lovely both in content and execution. The introduction of a bass clarinet to develop the melody is a nice touch but there is formal weakness in that this passage rather outstays its welcome being developed extensively through the strings for up to nearly five minutes. The next work, Záboj, Slavoj and Luděk, is apparently the first symphonic poem written by a Czech composer on a National theme. The liner does not explain the narrative so courtesy of the web I can say it is " Based on an 1817 poem by Czech patriot Vaclav Hanka that purported to be a thirteenth century manuscript, Zaboj, Slavoj and Ludek tells the story of the heroic and successful defence of the Czech nation against the invading Germans, a story that had obvious parallels with the German-speaking Austrians' 500-year-long occupation of Bohemia." As such it can be seen as the precursor for a sequence of similarly motivated tone poems from Smetana's Ma Vlast and Dvořák's Hero's Song through to Suk's Praga and Janáček's Taras Bulba. There is a fair amount of bombast and fairly generic battle music in the work but the performance here is full of feisty energy and vigour that I suspect gives the work as good a presentation as it could get. The liner moots that "it audibly impressed Smetana around the time he emabarked on .... Ma Vlast." Not sure about that - Smetana's opera the Brandenburgers in Bohemia predates Fibich by more than a decade, also deals with the occupation of Bohemia by German armies and has a similar dramatic musical vocabulary - and Smetana was stone deaf by 1875 so sadly not able to be audibly impressed by anything. More compositional comparisons are to be had with the next work: Toman and the Wood Nymph. Here there is no doubt that Fibich was forging a new sub-genre: the folk-tale inspired symphonic poem. Interesting that Vítěslav Novák chose exactly the same tale/title for his Strauss-inspired 1907 composition. A musical comparison is fairly pointless given the gulf in compositional styles between the essentially conservative Fibich and the modernist-leaning Novák. What is interesting is their different approach to the handling of the narrative. What becomes clear is that Fibich works with a more limited dramatic palette with sections juxtaposed against each for maximum contrast. There are lovely orchestrational touches - the strings playing with the wood of the bow - col legno - is quite unusual in a score of this date. Also, there is a seductive melody for cor anglais and violas that is rather beautiful. I like the sombre moralising brass chorale that closes the work too. All of these effects register very well in this recording. Only in a rather scrabbling string passage does the orchestra sound anything but impressive. The penultimate work on the disc is another Shakespeare-derived tone poem. This time The Tempest. Fibich is unique amongst 19th century composers, I think, in having written an opera on the same subject. No surprise that the tone poem opens with a storm at sea - again there's a nagging sense of the generic rather than the inspired and in a scrabbling string passage the orchestra sounds under pressure for just about the only time on the disc. After about three minutes this subsides into a surgingly yearning love theme presented by the massed strings. I like the ebb and flow Štilec gives the music here although just a tad of extra finesse from the strings would have made this even more impressive. This work I know in another recording as the coupling for Petr Vronsky performance of the Symphony No.1 with the Brno State Philharmonic Orchestra on Supraphon. There is even more idiomatic playing from the Brno players but the recording has less immediacy than the one under current consideration. Curiously, a very busy harp part clearly audible in Brno is completely obscured here which is both a surprise and a shame. Also interesting is the dancing melody that Fibich introduces around the 5:40 mark is a close cousin of a tune in Dvořák's Noonday Witch. Indeed the whole work breathes more of Bohemian air than some of the others - nominally more Nationalist works - on the disc to the music's benefit. That characteristic is certainly true of the best known and probably most wholly successful work on the disc - Spring. This is given a listing as Op. 13 but according to the liner was not first performed until 1881 which would make it the latest work. It is Fibich's "From Bohemia's Woods and Fields" and as such is the most completely successful work offered as it focuses on Fibich's strengths of instrumental colour and melodic charm rather than drama. My comparative version again comes from Supraphon - this time Frantisek Vajnar and the Prague Radio Symphony Orchestra (review). As before, the newer version is considerably better recorded but the older disc features orchestral playing with a shade more character; plangent clarinets and mellow horns suiting the bucolic good nature of the piece. This is the best of Fibich and both versions show it in a good light - for once Fibich's preference to linger in a pastoral idyll does not feel like the dramatic flow is being impeded. When the energy of the work does finally pick up around the 7:00 mark it is with a rustic dance - this time Štilec's harp is pleasingly audible. This Fibich develops and combines with the opening material most effectively until, with the sense of dusk drawing in the piece closes quietly. Richard Whitehouse supplies a useful succinct liner. The liner also takes care to note that these recordings are made using authoritative sources including the composer's manuscripts, copying errors have been corrected and 'standard' performance cuts removed. All of which is very welcome but I would be struggling to say I noticed a great deal of textual difference between this and the comparative performances. As previously mentioned, this is a marked improvement in every respect on Volume 1 of this series and as such a very welcome addition to the Fibich discography. There are no great masterpieces here, but in its own right this is appealing and attractive music winningly performed. Appealing and attractive music winningly performed. This is the third CD of a projected series of eight that will feature all of Fibich's orchestral scores. The first volume received my own enthusiastic welcome, though my colleague Nick Barnard was somewhat more critical. Gary Higginson enjoyed the performances and praised the recording quality in the second volume and Paul Corfield Godfrey's verdict was also generally favourable. This third disc has already been very positively reviewed by MusicWeb International's Editor Rob Barnett, a real enthusiast, it seems, for both the composer and this emerging Naxos series. Nick Barnard's review of Vol. 3 should be onsite by the time the present review is published. As Rob has already written about the individual works on this release in some detail, there is no need for me to repeat that information. Taking a broader overview, however, it is worth noting that, unlike many late 19th century occasional pieces, all these approachable scores - reminiscent of Dvorak at times, Smetana or Liszt at others - make a strong and genuinely memorable impact from the first hearing. I was particularly captivated by Fibich's very individual take on Othello, full of touches - or, indeed, quite substantial passages - that strongly call to mind the First Symphony that he was to produce a decade later (sample 4:50-8:46, for example). Toman and the wood nymph also exhibits that same direct appeal. Once again the players of the Czech National Symphony Orchestra offer us convincing accounts that demonstrate their easy empathy with Fibich's idiom. They have, moreover, been very well recorded by the team responsible for the two successful earlier releases. The project to record all Fibich's orchestral scores is clearly something of a labour of love for conductor Marek Štilec. His detailed research has, according to the usefully informative booklet with notes by Richard Whitehouse, corrected several long-standing errors in performance practice and thereby restored a great deal of authenticity to the music-making heard on this disc. The youthful Mr Štilec - he is just 29 years old - has, incidentally, undergone something of a makeover for this volume of the ongoing Fibich series. Whereas his publicity photograph used to make him look all of a fresh-faced 18, he has now adopted a rather severe pair of eyeglasses and a little five o'clock shadow. If those are gimmicky attempts to suggest that he possesses more conductorly gravitas these days, they are entirely unnecessary: these assured and completely idiomatic performances are quite enough on their own to demonstrate his expert professional credentials. I look forward with the greatest enthusiasm to listening to the remaining releases in this engrossing and enlightening series.